FRAMED PRINT. 22x18 inch (56x46cm) Framed Print with Black Satin with Off-White Digital Mat. Artwork depicting CROSSING RIVER ON REED. The Chinese patriarch, the Bodhidharma Po-Ti Ta-Mo, needing to cross the Yangtse river, stands on a reed which obligingly ferries him over. Shipping from USA. Artwork Description... 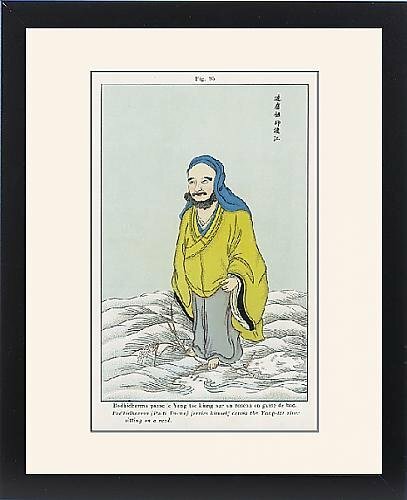 The Chinese patriarch, the Bodhidharma Po-Ti Ta-Mo, needing to cross the Yangtse river, stands on a reed which obligingly ferries him over.